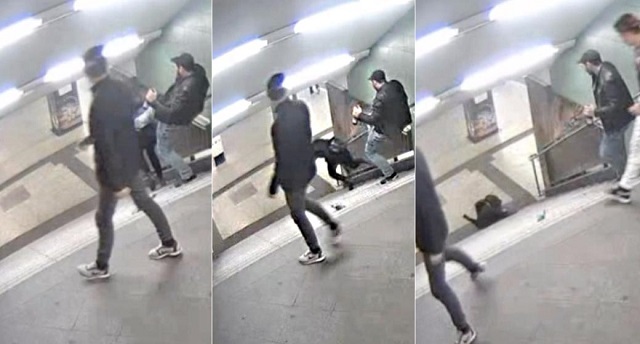 Disturbing video out of Germany shows a migrant kick a petite, 26-year-old blonde woman down a set of stairs from behind in an unprovoked attack. The migrant's fellow gang members do nothing to help the woman and simply walk away and she lies on the ground, reportedly in critical condition. According to Bild.de, the attack took place on October 27 after midnight in Neukölln. YouTuber Act For Germany says Bild.de reported "police are neither searching for the perpetrators nor have determined whether the video evidence is usable." When are the German people going to say "enough"?